Hey all, another blog post for my Class of 2018 seniors! We are getting down to the wire here, with only a couple of short months left before graduation! I'm so excited for the entire Class of 2018! I had so much fun with all of my seniors this past season, and Hannah was no exception. 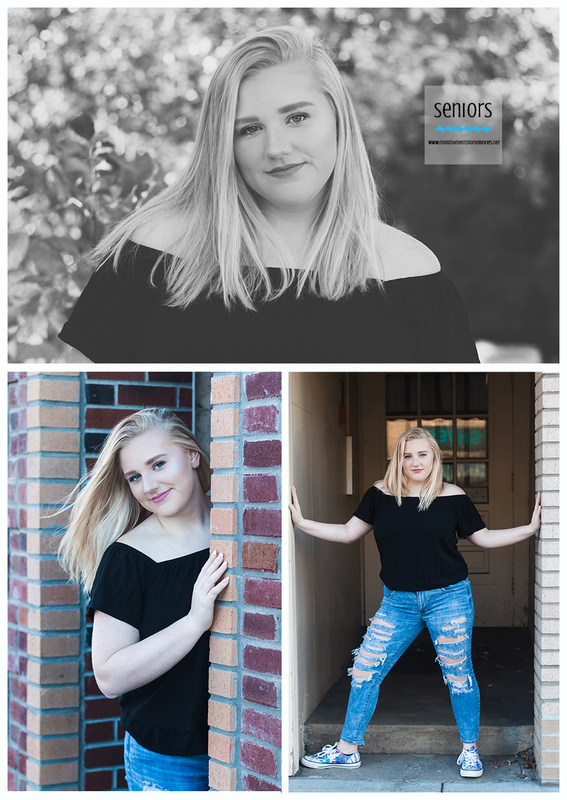 Hannah is a senior at Elk River High School. She is a member of the Elk River Dance Team and describes herself as outgoing, open-minded and honest. I have to add funny to that list. Hannah went to school and danced with my daughter, Baylee, so we had some amazing fun that night! She also brought her cousin and her mom to her session. Memorable! We did Hannah's session in my favorite season, Fall. The leaves were just starting to change and it was such a beautiful day! Hannah chose Downtown Anoka for her location. This is a very popular location for seniors, because of the diversity it has (I do too!). 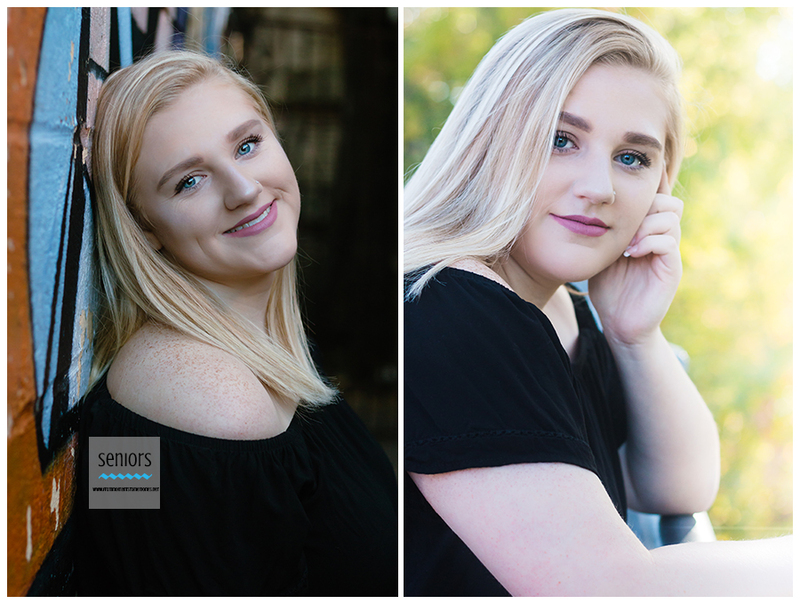 It has so many different "locations within a location", and Hannah loved it because she could have both city and country photos! It is easy for a photographer to get many different poses/shots so each senior can have their own unique experience! Baylee did some behind the scenes video and pictures for our Snapchat and Instagram stories. Earlier in the summer, I bought a changing tent to take on location with us to make it easier to change for them. Beats changing in the car with extreme temps! Here are a few behind the scenes pictures from my iPhone. We started out in the park area along the Rum River for some beautiful pictures on the river. Hannah brought her pom poms to get some dance team/pom pictures. The outfits Hannah chose fit perfectly with each section of Anoka. Hannah says she was going for a look that describes her and who she is. I would say she definitely made it work! Hannah did her own makeup, which looked fabulous! As a side note, if you are unsure of makeup application, we do offer that as a new add-on this year! We then headed through historic downtown Anoka for some more great pictures, this time a more urban setting. There are so many different shops and cafes, with nooks and crannies that make great backdrops. We headed a couple of blocks down for some country pictures at the feed mill, which is right down the block. This was my favorite outfit of hers! Our final stop was the river again for sunset and BFF photos with her cousin. Love me some Golden Hour! Hannah's advice for other seniors getting their picture taken? "Schedule your day out so you are not running behind and worrying about being late. Make sure you know what outfit you want first and how you are doing your hair and makeup ahead of time." I also asked Hannah what her overall experience was with her senior session. Her response? "I loved it! I had so much fun taking these photos!" We did too, Hannah! After high school Hannah plans to attend college and live her life to the fullest! Good luck in all you do, Hannah! You really are a super fun girl, and I wish you the best!